[157 Pages Report] The global advanced energy storage systems market was valued at USD 11.79 Billion in 2016 and is expected to grow at a CAGR of 8.38%, from 2017 to 2022. The key roles played by energy storage systems in power grids include time shifting to manage peak loads, providing power quality by aiding in frequency regulation, mitigating power congestion on grids, and supplying power uniformly in distributed generation. They are also used as a primary power source in electric vehicles. Factors driving the energy storage systems market include energy arbitrage opportunities, increasing renewable energy installations, and growth in the electric vehicles market globally. 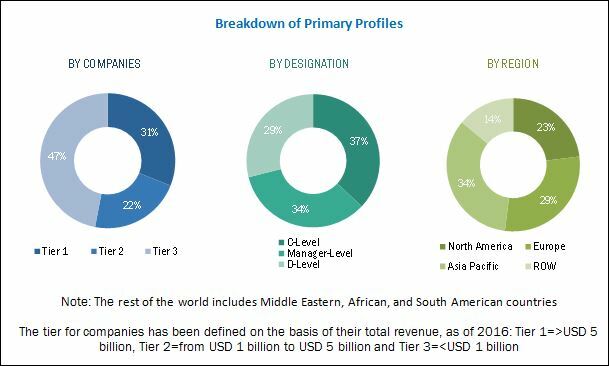 To forecast the revenue of market segments with respect to four main regions, namely, North America, Europe, Asia Pacific, and the rest of the world. To benchmark players within the market using proprietary, competitive leadership mapping framework which analyzes market players on various parameters within broad categories of the business and product strategy. This research study involved the use of extensive secondary sources, directories, and databases, such as, Hoover’s, Bloomberg Businessweek, Factiva, and OneSource, to identify and collect information useful for a technical, market-oriented, and commercial study of the global advanced energy storage systems market. Primary sources are mainly industry experts from core and related industries, service providers, technology developers, standard and certification organizations of companies, and organizations related to all the segments of this industry’s value chain. The points given below explain the research methodology. The ecosystem of advanced energy storage systems comprises companies, such as, ABB Ltd. (Switzerland), LG Chem, Ltd. (South Korea), General Electric Company (US), Samsung SDI Co ltd. (South Korea), GS Yuasa Corporation (Japan), Siemens Ltd. (Germany), Panasonic Corporation (Japan), CALMAC (US), Nippon Chemi-Con Corporation (Japan), Tesla Inc. (US), and Toshiba Corporation (Japan). The global advanced energy storage systems market is projected to grow at a CAGR of 8.38%, from 2017 to 2022, to reach a market size of USD 19.04 Billion by 2022. This growth is attributed to increasing renewable energy investments, growth in the electric vehicles market globally, and regulatory changes demanding energy efficiency. The report segments the advanced energy storage systems market, on the basis of technology, into electro chemical, thermal storage, mechanical, and others. The lithium-ion sub-segment, within the electro chemical segment led the market in 2016, and is projected to dominate the market during the forecast period. Moreover, technological advancements and growing deployment of lithium-ion batteries is expected to result in economies of scale, which would lower the cost for this technology, further driving the growth in the market. 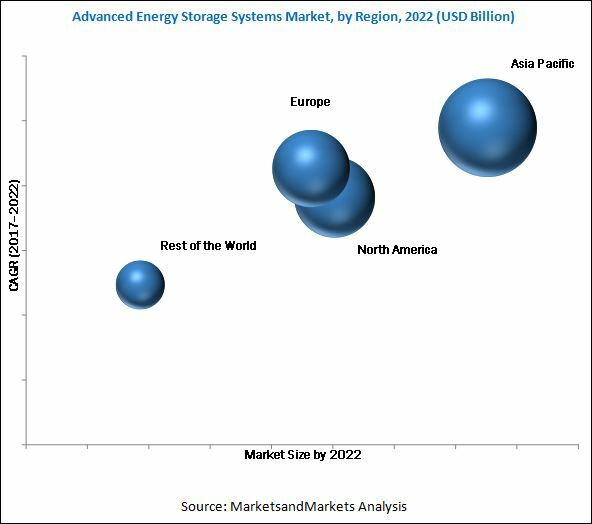 The advanced energy storage systems market has been segmented, based on application, into transportation and grid storage. The growth in this segment is primarily driven by increasing deployment of lithium-ion batteries in the electric vehicles market. Moreover, grid expansion and investment in modern infrastructure in developing countries also present opportunities for the growth. In this report, the advanced energy storage systems market has been analyzed with respect to four regions, namely, North America, Europe, Asia Pacific, and the rest of the world. The market in Asia Pacific is expected to dominate the global advanced energy storage system market, during the forecast period, owing to increasing number of electric vehicles in the region, especially in China. High initial capital requirement for few technologies and hazardous environmental impact could be the restraints for the advanced energy storage system market. Leading players in the advanced energy storage systems market include ABB Ltd. (Switzerland), LG Chem, Ltd.( South Korea) , Samsung SDI Co., Ltd (South Korea), General Electric Company (US), and Tesla, Inc. (US). New product launches was the strategy most commonly adopted by top players, constituting 31% of the total developments, from 2013 to August 2017. It was followed by contracts & agreements and investments and expansions. 10.4 Samsung SDI Co., Ltd.
10.10 Baltimore Aircoil Company, Inc.